Today's image is a little bit different. This is a young Great Plains Skink. When they are born they are all black with bright blue tails and as they grow to adulthood fade to the more mottled look and loose the blue color to their tails. 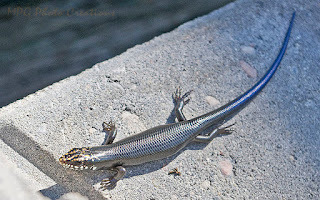 Skinks are also able to detach their tails when caught by them at will and then grow a new one back in approximately 3 months. A great form of defense for them. This Skink is one of the more common lizards found here in Kansas along with Collard Lizards. I see these guys around in my garden fairly frequently when I am watering. In this image I captured it on the patio.